In addition to giving you top-quality readings, our Advisors may have news or information they want to share with you. For example, they may want to tell you if they’re going on vacation and will not be available for a while, or they may have a follow-up to your reading, or just want to check in. To do this, Advisors with whom you have had readings in the past 90 days can send personal messages directly to your account. To see if you have any messages, and to access them, you must be logged in to your account. If you have unread messages, an icon will appear at the top of your account home page, letting you know how many unread messages you have. Click on the icon, or on the Messages tab in the left-hand navigation on your Account home page, to view your unread messages. Q: Given that Advisors can now send me personal messages, what information about me is available to Advisors before, during or after my call? A: When you call into the service, the only information an Advisor has about you is what you provide during the call itself. The only information we provide our Advisors is a daily list of callers' first names or user names, and the time and channel of their call. 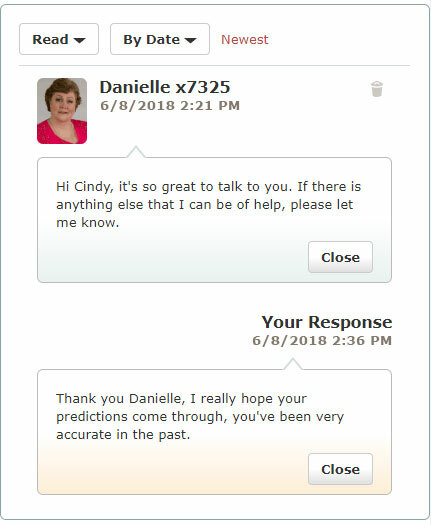 We encourage Advisors to take few moments to focus in on the reading after the call, and use the new messaging feature to share words of encouragement based on their personal recollection of what transpired. Q: What if I do not want to receive messages in my Account? A: If you do not want to see messages, simply do not click on the Messages icon or tab. You cannot stop messages from being sent to your account, but you do not have to read them. At this time, you do not have the ability to turn messaging on or off or select messaging preferences. We will explore adding this capability in the future based on customer demand. Q: I don’t see any Advisor messages in my Account. Why are my Advisors not messaging me? A: Messages can be sent only by Advisors with whom you’ve had a reading in the last 90 days. Sometimes an Advisor may have a follow-up message after a reading, and sometimes they may not. 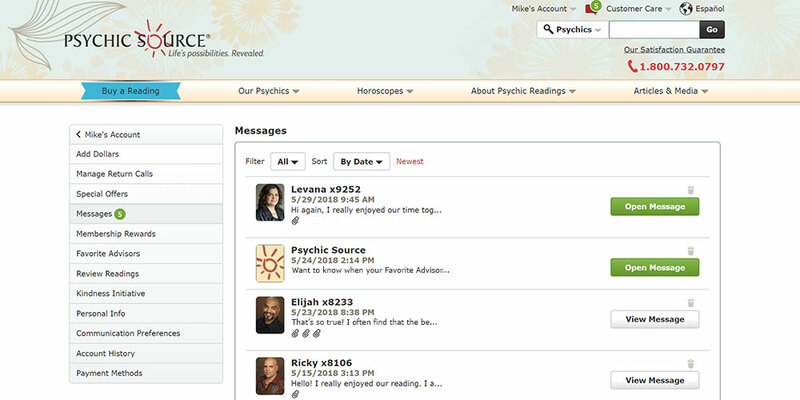 Q: How do I know if a message is from an Advisor or from Psychic Source? A: You will see an advisor's photo or picture in your inbox next to their message. Messages from Psychic Source will contain the sun image from the Psychic Source brand mark. Q: I see a paperclip in my message. What is this? A: A paperclip means that there is an attachment that has been added to that message by Psychic Source or the Advisor that it is from. To open your attachment, click on the paperclip. Q: How can I reply to a message? A: You can reply one time to the message that an advisor sends you. To do this click on the reply button and simply type your message and hit send. The advisor may or may not reply to your message. Q: Can I add an attachment to my reply to the advisor? A: Currently you cannot send attachments to your reply to the advisor. The ability to attach images and files is coming soon. Q: How long will messages be stored on my account? A: Messages from Advisors are indefinitely stored in your account. If you no longer wish to see a message you can delete it by clicking on the trash can icon. The length of time that messages from Psychic Source will be stored will vary based upon relevance. Messages will be available forever, deleted messages will be permanently removed.